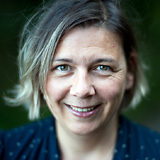 Elisabeth Blanchet was born in Normandy in 1970, grew up in both Brittany and Normandy, and worked as a maths teacher in Rouen, Lyon and Lomé in Togo, where she lived for 4 years. She also spent time in Romania in the 90s working for a charity she had set up to help abandoned children. Her grandfather bought her her first camera when she was a child and since then she has always taken pictures and been obsessed with images. She moved to London in 2001, and in 2003 became a full-time photographer. Her work is regularly published in Time Out, national UK papers, and European magazines such as Le Figaro, Le Soir, l’Agefi, Neon and Marie-Claire. She also works as a travel photographer for Frommer’s. She is interested in meeting people and telling their stories using stills, moving images, words and sounds. “Communities”, “minorities”, “memory”, “heritage”, “habitat”, “childhood” and “nostalgia” are themes that always feature in her main pieces of work, such as the Ceausescu’s Orphans, 20 Years On project, or her archive of photos of Gypsies and Irish Travellers in the UK.